Green Drain™ Waterless Floor Drain Traps are one-way valves that allow water to flow down the drain while preventing insects, animals, odors, harmful gases, and pathogens from entering your living or work space. This one-way valve opens to allow water to flow down the drain and closes when no water is flowing. 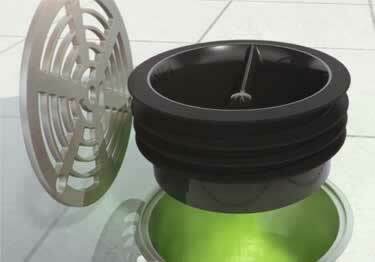 Green Drain™ seals off the entry of sewer and gas odors coming from dried traps. Its attached silicone skirt prevents drain flies, roaches, rodents and other unwanted pests from entering up the floor drain. Green Drain™ can also be inserted into the drain housing of kitchen sinks to reduce noise and backsplash from garbage disposal units. It is easy to install and eliminates the need to add water to the trap. Made to last, Green Drain Waterless Floor Drain Traps have a UV resistant ABS plastic housing, silicone rubber sealing flapper and four flexible sealing ribs. Tested and certified to the ASSE 1072 Standard, UPC and listed with IAPMO&I.C.C. Floor Drain Traps available in 2", 3", 3.5" and 4" connection sizes. Great for commercial, residential, and institutional applications. Sold Separately: Need help cleaning organic material from traps and drains? Try ZymeCLING Multi-Purpose Bio-Enzymatic Gel or Nilozyme Trap and Drain Treatment. ZymeCLING breaks down and digests organic materials like proteins, starches and sugars from hard to reach drains helping improve drain flow, reduce odors, and reduce unwanted pests like drain flies. This non-pathogenic, non-caustic gel is safe for use in all types of plumbing. It is great for trap and drain maintenance, as a garbage disposal refresher, urinal and commode treatment, and as a drain fly treatment. Nilozyme Trap and Drain Treatment, formulated with multiple strains of bacteria, will liquefy and consume complex proteins, cellulose, starches and other organic waste found in grease traps, drain lines, septic tanks and lagoons. Nilozyme is non-toxic, non-pathogenic, non-corrosive and certified salmonella and pseudomonas-free. I have a concrete made sanitary sewer drain that I would like to be able to add a one way flow trap. I have a picture to show you in more details of what it looks like. If there is a way that I can send it to you and if you could help me to see if there is a product for it to add a one way flow trap. Had these for about a month and they've worked great so far. Thank you for your review. We very much appreciate your feedback. We have actually installed 2 of these at our corporate headquarters and they are great, you're exactly right. Totally keep out odors and bugs as well. Thank you for your review. We are very pleased you thought the product was great. Exceeds ADA&industry standards. Straight grab bars for safety. Hotels, hospitals, nursing homes, commercial&residential use.